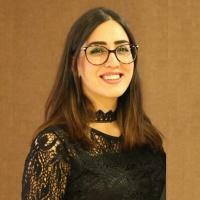 Noura Abdulhadi is a Communications and Public Relations Specialist, with skills and experience in Public Relations and Corporate Communications. She currently serves as the Communications Specialist for DAI's Finance for Jobs Project - F4J. Noura offers significant abilities in the areas of press release development, media relations, PR information, event management and emcee performance. She is very familiar with writing and editing website content, emcee content and PR content as well. Earlier, Noura has worked with Palestine Trade Center- PalTrade for 3 years as the Public Relations officer, performing a wide variety of activities, including creating and presenting press releases, coordinating public relations and marketing activities, conducting presentations, developing and maintaining successful relations with the press and media. Noura has lent her voice to numerous documentaries and ad campaigns, and she has served as an emcee at various public and national events. Noura holds a BA degree in Media Radio Broadcasting/ Minor Television and double minor in Public Relations.